Posted on 06. Jan, 2013 by Mike Fieldhammer. Here’s a lazy Sunday night blog post. Below is the information on the new dates for the CSI (BCAPL) events that have been in May at the Riviera for many years. CueSports International, Henderson, Nevada (January 4, 2013) – CueSports International (CSI) is expanding the roster of professional tournaments at the Rio All-Suite Hotel & Casino, Las Vegas in July 2013. CSI will introduce the inaugural US Open 8-Ball Championship on July 23-27, sponsored by the American Cuemakers Association. The new event will follow the well established pro events produced by CSI – the 14th US Open One Pocket Championship and the 5th US Open 10-Ball Championship. As with the 10-Ball event, the US Open 8-Ball Championship will be $25,000 added and a 2013 Billiard Congress of America (BCA) Points Event. The two BCA Point Events will be held back to back under one roof, greatly assisting US players in their quest for pro points while keeping travel expenses lower. The combination of CSI US Open events in July is truly unique. In the course of 10 days top US and international players will have the opportunity to play in three professional level tournaments in three separate disciplines with a combined total of $60,000 added. The US Open 8-Ball and US Open 10-Ball fields will be limited to 96 players and the US Open One Pocket will sport a 64 player field. In 2010 CSI, which is also the parent company of the BCA Pool League (BCAPL) and USA Pool League (USAPL), launched the US Open 10-Ball Championship in conjunction with the BCAPL National Championships, known as “The Greatest Pool Tournament in the World!” CSI added HD live video streaming by TheActionReport.com (TAR) and free stream feeds to each of the host hotel rooms. In 2011, CSI added the US Open One Pocket Championship and the 14.1 High Run Challenge. For 2013, “The Greatest Pool Tournament in the World!” will present three new events: the US Open 8-Ball Championship by CSI, the 2013 WPA World Artistic Pool Championship, and the 25th Annual Junior National 9-Ball Championships, which is produced by the Billiard Education Foundation (BEF). New also in 2013 – spectator general admission to all three CSI pro events, the world artistic pool and junior national competitions, and the 14.1 challenge will be FREE to the players competing in the BCAPL & USAPL National Championships (July 17-27, 2013) also being held at the Rio All-Suite Hotel & Casino. CueSports International is dedicated to creating more choices for all players. CSI supports the WPA/BCA structure to govern the sport and to promote an organized hierarchy for pool player advancement. In the past 8 years CSI has directly paid out $8,000,000 to players. CSI is the parent company of the BCA Pool League and the USA Pool League. CSI also produces independent events such as the US Bar Table Championships, the Jay Swanson Memorial, the US Open One Pocket Championship, the US Open 8-Ball Championship and the US Open 10-Ball Championship. Visit www.playcsipool.com, www.playbca.com, and www.playusapool.com for more information about CSI and its divisions. Posted on 15. Aug, 2010 by Mike Fieldhammer. Team Support. The sum can be greater than its parts. 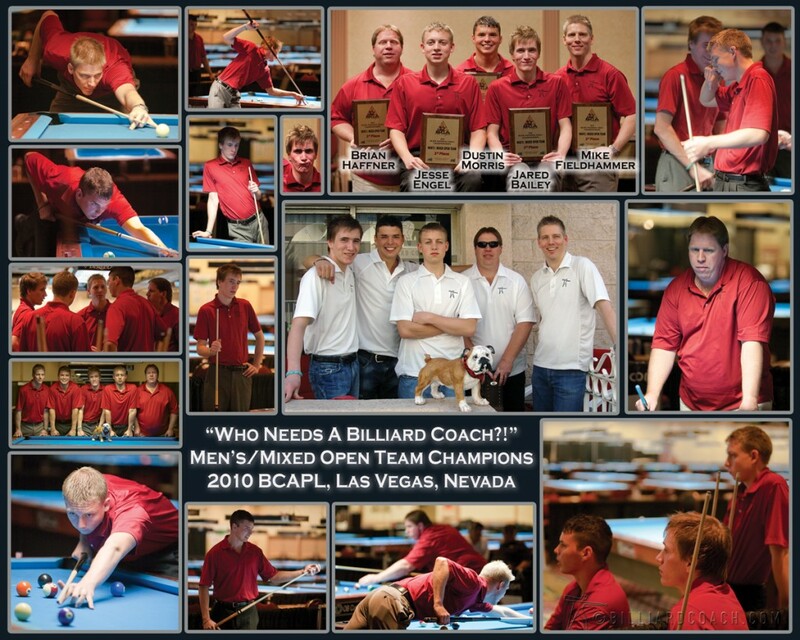 My most recent memorable experience is winning the BCAPL National Team tournament in Las Vegas in May. The five man squad sardonically named “Who Needs a Billiard Coach? !” fought through a field of 674 teams to take the top prize of $11,000. The whole event was an exhilarating ride for me, propelled by the support of my team: Brian Haffner, Jared Bailey, Dustin Morris, and Jesse Engel. A photo collage I framed and presented to each teammate. Click for larger view. Team chemistry is a phrase that is tossed around, but is just one piece of having a successful team. Chemistry implies that there may be many elements blended into a concoction of a cohesive team. Perhaps one of the most important elements is the support of one’s teammates. Our team was successful l in believing in each other and affirming each action our teammates made. Examples of this blind trust are as follows. For example, if Dustin played an unsuccessful combination shot in an effort to continue his run instead of shooting a solo ball in a different pocket, Jesse said, “Good try, you’ll get another shot this game. Your opponent isn’t getting out here.” We never took issue with a shot or a decision made by a teammate. Or if Brian missed a jump shot instead of kicking the ball which would have been my choice, I didn’t say “Why didn’t you kick at it?” Placing a seed of doubt in his head or shaking his confidence could be the beginnings of a skid in his and the team’s performance. Players on our team tried to sweat other teammates matches whenever possible. Caring enough to watch and root them on is an obvious sign of support. Even during a team match, I could hear Jared’s voice say, “Good shot Fieldhammer!” and it would further my resolve to win that game knowing he was spurring me on. Players on our winning team are selfless. We cared about our own performance only as it related to the team goal of winning matches. Never was heard, “Well, I got mine” when a player came to sit down after winning a game. At its best, unconditional support for one’s teammates can be a catalyst to launching the team to heights unattainable by the five as individuals. Each of the five players on the team made sacrifices for the sake of the team. The team goal that we all had in mind became a truly satisfying achievement that became much sweeter because we shared it with teammates who gave and received support. Posted on 28. Aug, 2008 by Fieldhammer. CueSports International, LLC (CSI), the parent company of the BCA Pool League (www.playbca.com), the United States Bar Table Championships (USBTC) and the Jay Swanson Memorial Tournament, would like to announce the National Championship Series (NCS). The NCS will be a series of five national events in the following cue sport disciplines: 8-Ball, 9-Ball, 10-Ball, 14.1Continuous and One Pocket. The first NCS event will be the 8-Ball Division. For players to participate in the 8-Ball Division they must be either a U.S. resident or possess a U.S. passport. The winner will receive all paid expenses to the prestigious World Pool-Billiard Association (WPA) 2009 World 8-Ball Championship. Last year?s world event was held in Fujairah, UAE. The 2009 event is anticipated to be held in mid-April. The following information applies to all five NCS events. 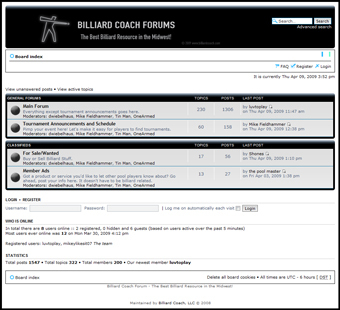 Qualifier tournaments will be held at billiard rooms throughout the United States. All NCS events will be open to men and women – both amateurs and professionals. Players are not required to be a member of any national league or association. In the initial years of the NCS, everyone must qualify – there will not be any invited players. Mark Griffin, CEO of CSI expressed the need for a more formalized national championship system, ?The U.S. is one of the few countries that does not conduct national championships. CSI saw the possibility of creating opportunities for pool players while offering national exposure for the billiards industry. This structure will determine for the first time a true national champion in all five disciplines.? More information will be released in the next few weeks. Room owners with any questions, interest in hosting a qualifier in your state or region, or in hosting the national event, please contact Holly Ryan at "> or at 702-719-7665. CueSports International, LLC, goal is to create and improve opportunities for pool players of all abilities through fair governance and equitable policies.